Nine 1-cm by 1-cm squares are arranged to form a 3 × 3 square, as shown below. 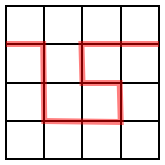 The 3 × 3 square is divided into two pieces by cutting along gridlines only. What is the greatest total (combined) perimeter for the two shapes? The answer to this problem appears below. Pause here if you’d like to solve it before reaching the spoiler. This problem epitomizes what I love about math competitions. The answer to the problem is not obvious. This is the case with many competition problems, unlike the majority of problems that appear in a traditional textbook. The solution does not rely on rote mechanics. Again, this differentiates it from a standard textbook problem or — shudder! — from the problems that often populate the databases of many skill-based online programs. Students have to get messy. That is, they’ll need to try something, see what happens, then decide if they can improve the result. Students have to convince themselves when to stop. Or more precisely, they’ll need to convince themselves that they’ve found the correct answer. For instance, let’s say a student divides the square into a 3 × 2 and a 3 × 1 rectangle. The combined perimeter is 18 units. Is that good enough, or can you do better? This is different from, say, a typical algebra problem, for which students are taught how to check their answer. The problem also epitomizes what many people hate about math competitions. The problem is presented as a neat little bundle. This is rarely how mathematics actually works. True problems often don’t present themselves all at once; it’s through investigation and research that the constraints become known and the nuances are revealed. All that said, I believe that the pros far outweigh the cons. Benjamin Franklin Finkel said, “Many dormant minds have been aroused into activity through the mastery of a single problem.” I don’t remember the last time a mind was aroused by the solution to x + 7 = -3, but I’ve witnessed awakenings when students solve problems like the one above. And here’s the tragedy in all of this: Many teachers believe that only kids who participate in math competitions can handle — or appreciate — math competition questions. No! Quite the opposite, in fact. Students who have tuned out have done so because they’ve never been challenged and, worse, have never felt the thrill of solving a problem on their own. How many ways are there to divide a 3 × 3 square into two pieces that will yield the maximum total perimeter? What is the maximum total perimeter if a 3 × 3 square is divided into three pieces? What is the maximum total perimeter if a 4 × 4 square is divided into two pieces? …a 5 × 5 square? …a 6 × 6 square? The answer to the problem about the 4 × 4 square appears below. Pause here if you’d like to solve it before reaching the spoiler. (wait for it) What is the maximum total perimeter if an n × n square is divided into two pieces? It was that last question that really got the blood pumping. What’s the solution for an n × n square? That’s left as an exercise for the reader. Alex made a Father’s Day Book for me. Because the book didn’t make it on our trip to France, however, I didn’t receive it until this past weekend. It was worth the wait. I loved when you took me to Smashburger. I appreciated when you helped me find a worm. I love when you read to me at night. I love when I see you at the sign-out sheet [at after-school care]. It means I can spend time with you. The average of 23 an 17 is 20, and 202 = 400. The difference between 23 and 20 is 3, and 32 = 9. Subtract 400 – 9 = 391. So, 23 × 17 = 391. The average is 3,245.5, and (3,245.5)2 = 10,533,270.25. The difference between 6,433 and 3,245.5 is 3,187.5, and (3,187.5)2 = 10,160,156.25. Subtract 10,533,270.25 – 10,160,156.25 = 373,114. So, 6,433 × 58 = 373,114. Sure, it works, but that problem screams for a calculator. The trick only has utility when the numbers are small and nice enough that finding the square of the average and difference is reasonable. Son: Would you do my homework? Dad: Sorry, son, it wouldn’t be right. 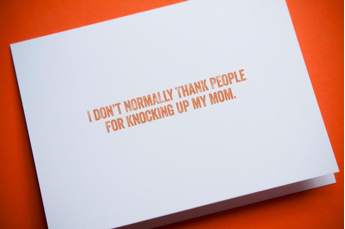 Son: That’s okay. Can you give it a try, anyway? The following is a Help Wanted ad that Alex made in school. 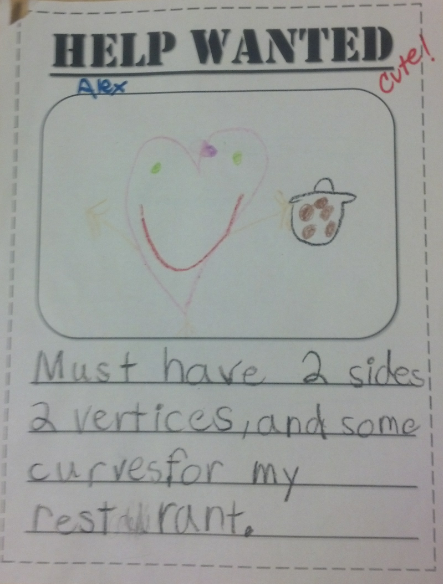 Were I to open a restaurant, I would look for similar qualities in my wait staff: sharp and curvaceous. The Math Diner — where everyone gets a square meal! Too cold to run to the convenient store for a six-pack? Too many Allen wrenches necessary for you to put together that Vrådal loft bed that you bought from Ikea? Want someone to walk Fido while you finish the last 1,126 pages of War and Peace? If you need something done but you’re too lazy or unqualified to do it yourself — and if you live in certain metropolitan areas — then you can have one of the “runners” at TaskRabbit do it for you. It’s a service that turns grunt work into a game. Simply post the task that needs to be done, and runners bid for the opportunity to do it. There is no limit to the types of tasks that are listed. A recent posting asked, “Do you know a Girl Scout from whom I can place a cookie order?” One of the top runners completed the task “Prank Call Our Customer Service Rep” in which he posed as an animal-welfare activist who sought donations to buy Viagra for soon-to-be-extinct Siberian tigers [“Call of Duty,” Wired, Aug 2011]. Statistician needed to massage data from a research study to get the results we’d like. Geometer needed to square a circle and/or trisect an angle. Looking for contractor to build real-life version of Waterfall by M. C. Escher. Logician needed to figure out who shaves the Barber of Seville. Number theorist needed to rationalize the denominator of a fraction with sqrt(pi) in the denominator. Spatial geometrician needed to get Dirk Gently’s couch unstuck, or to walk through a revolving door with a pair of skis on her shoulder. Some folks have referred to me as “a real cut‑up.” Of course, those folks are generally septuagenarians who still use words coined in the mid‑1800’s. But I take it as a compliment, perhaps because I’m a fan of dissection problems. Humor can be dissected as a frog can — but the thing dies in the process, and the innards are discouraging to any but the pure scientific mind. Like jokes and amphibians, geometric figures can be dissected, too. The following are three of my favorite dissection problems. With three cuts, dissect an equilateral triangle so that the pieces can be rearranged to form a square. Remove a tetrahedron of edge length 1 unit from each vertex of a larger tetrahedron with edge length 2 units. In total, remove four tetrahedra, one from each vertex. The image below shows one of the tetrahedra being removed. What is the shape of the solid that remains? Finally, here’s an original dissection problem. Form a pentagon by placing an isosceles triangle with height 1 unit on top of a square with side length 2 units. Then find a point P along the perimeter of the pentagon such that when P is connected to two vertices, the three pieces into which the pentagon is divided can be rearranged to form a square. Find the area of the largest piece. As usual, these problems are presented without answers or solutions. 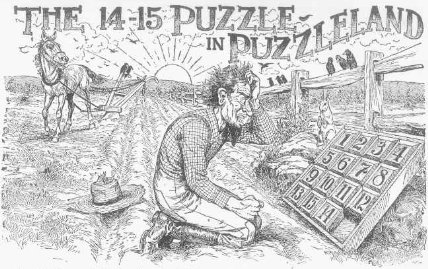 More fun can be had if you solve them yourself.